A very nice review of our Blackberry Cobbler tea! Thank you SororiTEA Sisters! 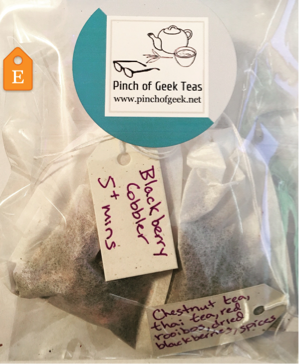 You can order the Blackberry Cobbler with 20% off your first order by putting "GeekyTeas20" in the notes. Well, I did it! Etsy shop is officially up and running. The Etsy shop I started a couple of weeks ago has been updated and new tea blends added. Most blends are geekily (It's totally a word. I just made it up.) named as a reference to some of my favorite things like Doctor Who, Alice in Wonderland, or books. I am hoping to add a few more blends like strawberry grapefruit and an apple/cinnamon/chestnut? Any suggestions on names would be greatly appreciated! Check out the shop here! This is a super simple idea that makes a truly wonderful hot day treat. I also love to put them in water bottle to take to work with me. All you need to do is clean and wash your fresh herbs and the fresh fruit add them to an ice cube tray and fill with water. Carefully put in freezer and like magic, you have infused flavored iced cubes. Dried Fruit into Tea: It's Like Magic! I grow a lot of fruit and flowers. I love my roses and lavender but I love mixing all of them into tea even more! A great way to preserve nature's bounty of fruit and flowers is to dry them and mix them with your favorite blends of tea. I am particularly partial to Strawberry Grapefruit green tea and Lavender Vanilla Earl Grey. I also use some of my herbs from the garden to add a bit more to the flavors like fresh mint or basil. I know the basil sounds weird but basil Strawberry is amazing! Brand new Etsy shop for custom, loose leaf tea blends! This is one of my favorite sauces of all time. 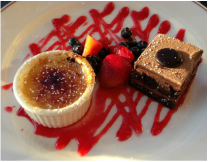 It is perfect over crème brulee, chocolate cake, cheesecake, or even ice cream. It is decadent and rich. If you preserve it in the small sauce jars, then you can have some on hand whenever the need arises! Alternatively, if you have previously frozen berries, then you can use them in this recipe for a quick sauce. 1. Add raspberries to large sauce pan over medium heat. Smash, smoosh, and pulverize the berries as they heat. 2. Add in the rest of the ingredients to the pan in the order listed. 3. Bring to a boil and stir frequently to get the jam to melt, sugar to dissolve, and alcohol to evaporate. 4. Cook until significant amount of water has evaporated about 5 minutes. It should have a sauce like consistency. 5. * Added step but really does make it better, I promise: Pour contents of the pan into a glass measuring cup. Put strainer into a large glass or mason jar. Carefully pour the sauce into the strainer a little at a time. You will want to use a spoon to stir it around in the strainer to get the sauce out but keep the seeds in. [This is tedious, I know, but I promise the sauce will taste better and be much better on desserts!] Repeat until all of the sauce has been strained, so no seeds remain. Scrape/rinse out the pan to remove any left over seeds. Pour your now strained sauce back into the pan. Reheat sauce to a boil. 6. Then laddle into sterilized jars (I recommend the 4 or 8 oz size jars) and follow directions for preservation of high acid jam in water bath. - I love it over a basic New York cheesecake (even a fancying up a store-bought frozen one!). What other ideas will you serve it with? 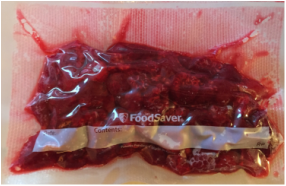 A quick and easy way to preserve all the tastiness of fresh fruit is with a vacuum sealer! This works great for grapes, raspberries, blackberries, blueberries, strawberries, watermelon, cantaloupe, and sliced peeled bananas. I divide up my fresh fruit and seal them into little pouches of various sizes: 4oz, 8oz, 16oz. Then I toss them in the freezer. That way I don't have to make all my sauces and jams right away. I have them saved for another day when I have more time and energy (or just a clean kitchen with space to work in!). This is one of my favorite jams to make. It has an unexpected heat, which makes it perfect over cream cheese served with crackers, on a steak sandwich, or glazed onto roasting chicken! - 2-3 medium sized green jalapenos (if you really like spice substitute 1 small habanero pepper - warning it is very hot!). Always use latex/prep gloves or wrap hands in plastic wrap and do not touch your eyes, face, etc. while cutting and seeding peppers! 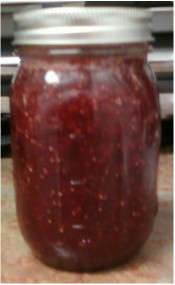 As you can see, I don't use any pectin in my jams. You can, I won't judge. I just hate having to buy it and I never seem to have it in stock when I need it, so I gave up and just follow the Spoon Test for consistency/texture. 2. Heat oven to 250 degrees. Pour sugar into a glass 8x8 pan. Add jalapenos on top of the sugar. Spread out in a layer. Cook in oven for 20 mins. 3. Use a large stainless steel or enamel sauce pan, pour in raspberries (and lemon juice if using) to the pan. Bring to a full boil over high heat, smooshing the berries with a fork as they heat. 4. Boil hard for 1 minute, stirring constantly. If you are using frozen raspberries, you may need to boil for slightly longer due to the high water content. 8. Follow directions for high acid preserve in a water bath. - Use as a topping on sandwiches like steak sandwich with goat cheese and arugula on a toasted hoagie roll.